KANSAS CITY, Mo. — As an actively anti-racist church organizer of The Open Table KC, Nick Pickrell says it’s important for the 1001 new worshiping community he founded to bring in “more people of color than white folks” to speak during their twice-per -month Sunday night gatherings. As The Open Table meets around the dinner table and talks about faith and spirituality — and the ways that culture and politics intersect with those — attendees are taught about what their neighbors need. “This allows us to partner with our community to meet those needs,” says The Open Table KC co-curator Wendie Brockhaus. Which is what The Open Table’s partner congregation, Second Presbyterian Church in Kansas City, Mo., was hoping for when the church put out a job description for a local missionary. The church wanted someone to be part of the community to help re-engage with the neighborhood in new ways. They ended up hiring Pickrell, in part because of his experience as with the Catholic Worker Movement. Pickrell describes folks coming to The Open Table as indigenous, black, white, young, old, gay, straight, rich and poor. For Rock, The Open Table’s gatherings with such a diverse community is life-giving. On Sunday night he finds that he’d rather come and do dishes and just look out at the community and listen to the conversations. Sometimes Brockhaus finds herself looking out over the room too — and that’s when it occurs to her that she is seeing the gospel happening right before her eyes. Both The Open Table KC and Second Presbyterian are grateful for the ways the Presbyterian Church (U.S.A.) and specifically the 1001 new worshiping communities movement has allowed them to thrive. 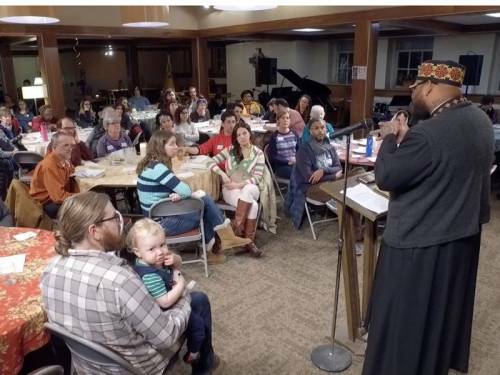 The Open Table has received Mission Program Grants, which are made available through the Racial Equity & Women’s Intercultural Ministries of the Presbyterian Mission Agency. These grants support new worshiping communities’ and mid councils’ work to transform existing churches. In 2012, the 220th General Assembly of the PC(USA) declared a commitment to a churchwide movement that resulted in the creation of 1001 worshiping communities over the next 10 years. At a grassroots level, nearly 500 diverse new worshiping communities have formed across the nation.